I have to admit that I was pleasantly surprised by the Fluidflex FKT. 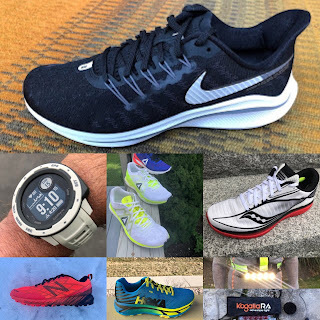 After reviewing the heavier Caldorado and the (even heavier) Trans Alps last year (RTR review here), the Fluidflex FKT is a much faster, lighter, more responsive race ready shoe. Out of the box, this shoe feels quite light and even lighter on the foot. My US men's size 10 comes in at about 9.6 oz/273 g on my scale, so this shoe is even lighter than the advertised weight which for a size 9 men's is 9.7 oz Does the FKT live up to it's name? The upper comprises of a very lightweight, breathable mesh with six sturdy and secure overlays that originate at the lace holes and run vertically/diagonally toward the midsole, providing excellent security in the midfoot, while allowing a bit of forgiveness and room in the forefoot, allowing for swell and splay, without compromising handling in technical terrain. The synthetic toe bumper is moderately thick, sturdy and should withstand all but the worst rock stubs. The Fluidflex FKT is low profile and has a minimal race look to it. From above, this looks like a pretty straight shoe, but has a very accommodating last that should satisfy most feet. The tongue is gusseted, which in my opinion, helps much more with fit, security and ease of entry (not having to align the tongue is a very welcome convenience). The tongue is moderately padded and with the sewn leather patch on the front (see above photo), it does a great job protecting the foot from the laces no matter how cinched down they are. The insole is supportive, well cushioned and structured. The heel collar has a very nice shape to it, with good padding and excellent heel hold. Height is just right, offering good stability and protection, without feeling overbuilt or too high. The heel counter is semi flexible, with a thin plastic heel cup, with added reinforcements sewn to the outside rear of the heel. Fit is true to size and as mentioned above, has a very secure midfoot and heel. The toe box is more roomy than I expected, no overly so, but enough for some swell and splay. I did find myself snugging the laces a bit extra to compensate, but not overly so. Ventilation is very good, as the mesh feels quite airy. Out of the box, the upper creased in an awkward way across the forefoot as shown in the photo below, but after a handful of runs and getting them wet once, it became no longer noticeable. The Fluidfoam midsole has a firm, but very well cushioned and extremely responsive feel to it. At 15 mm in the heel and 11mm in the forefoot (Editor's Note: without insole which should add about 7mm making it per Running Warehouse here 22mm heel/18mm forefoot), the Fluidflex FKT is typically less cushioned than I will regularly run in, but cushion and protection is much better than I would expect from such a light and somewhat minimal shoe. I feel comfortable running in this shoe for several hours without feeling beat up. The special sauce in the FluidFlex FKT is the Fluid Guide/Fluid Frame midsole. Essentially Montrail uses a patented process to layer in raw materials that when heated and compressed will produce different densities and thus firmnesses in a smoother gradient than the typical glued in posts and firmer mid foot stability foams. The result is superb torsional rigidity, great stability on rough terrain, a decently cushioned heel, and flexible protected forefoot if a bit awkwardly flexible so due to the forefoot rock plate. "Small pellets of varied density foam are hand poured into a mold in a layering process that creates the density/durometer gradient. That mold is heated and expands into one large contiguous pieces of foam. Which ultimately is put into the final compression mold to become the midsole." The midsole is thus all of the same material blending and quite seamless feeling in terms of ride. No posts, no adhesives, not sensation of dramatic differences between segments of the midsole. Others may take this approach or something similar but I haven't seen it. The result is a relatively soft heel, firm supportive mid foot then softer under the forefoot protected by the rock plate. The outsole is a combination of Gryptonite rubber in the critical, high wear landing/impact zones and foam in the center of the shoe for lighter weight where traction and durability are less of a concern. 5 flex grooves across the shoe help make the shoe adequately flexible and a forefoot Trailshield plate adds great rock protection without compromising trail feel and flexibility. The diamond shaped lugs are numerous and low profile, seemingly randomly scattered, but effective for the majority of dry trails. Traction in snow, mud, steep and loose terrain is not so great and I would recommend the FKT for dryer conditions. Wet traction is average if you are able to land on the Gryptonite rubber, but in rocky technical terrain, this is not a given and landing on the foam under the middle of the shoe will be less than secure in the wet. The ridged rubber lugs in the heel do a great job with downhill braking. Outsole durability is average, with about the wear I would expect for the rocky trails that I run. The foam in the middle degrades a bit faster, so perhaps not ideal if you primarily run on rocky, technical trails. The Fluidflex FKT is fast, responsive and race ready out of the box. It is quite stable and precise, with excellent trail feel and flexibility, but simultaneously with better than expected cushioning and protection. The FKT makes for a worthy lightweight race shoe for shorter to mid distances on dryer, less technical trails, a great up tempo training shoe or a shoe that is also very competent on the road, making it a nice door to trail shoe. Columbia/Montrail Fluidflex FKT vs. Brooks Mazama (RTR review here): Both are very fast, light and responsive. The FKT is $30 less expensive and cushioning is slightly better. Both make very good door to trail shoes as well. The Brooks upper seems to be a little more compliant and comfortable to me. 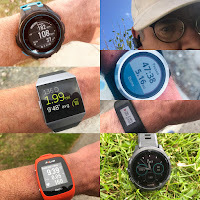 Columbia/Montrail Fluidflex FKT vs. Hoka One One Speed Instinct (RTR review here): Both are very quick shoes, with the FKT having a bit better response and better protection. The Speed Instinct has a bit softer cushion and a more durable outsole and better traction. Columbia/Montrail Fluidflex FKT vs. adidas Adizero XT 5 Boost (RTR review here): The XT5 has much better traction and outsole durability, but they both are quite responsive, fast and run well on the roads. Protection is similar. Columbia/Montrail Fluidflex FKT vs. Saucony Peregrine 7 (RTR review here): The Peregrine 7 is much more of an all mountain shoe, though both shoes are very quick, responsive, protective and race ready. Depends on the terrain. Columbia/Montrail Fluidflex FKT vs. New Balance Vazee Summit (RTR review here): both are fast and light, fit is similar, durability is comparable and are within $10 of one another (the Vazee is $10 less). The Vazee has better traction for more varied conditions, but does not run as well on the roads as the FKT. Editor's Note: Columbia/Montrail Fluidflex FKT vs, Montrail Fluidflex ST ( my RTR review here); The FKT essentially updates the upper of the prior ST, in a good way, as the ST had a comfortable but snug, almost suffocating feel, especially in the forefoot. Support from the upper in the FKT remains excellent. FKT gains $15 in price over the ST.
-.2 for looks/lack of color choices. I can't seem to get used to the grey camo look. Jeff is a former pro cyclist who now runs and climbs the mountains of Colorado. He has been top 5 Masters, top 25 overall, at the Pike's Peak Marathon several times, finishing 3d Masters this year. Jeff loves vertical accumulating more than 500,000 vertical feet per year, has climbed all the 14's and 200 of the 13's and has held FKT on several. He often runs and climbs at night. Passionate about the sport but also the gear he has reviewed hundred of shoes for various magazines and sites and participated in product testing for many brands. Formerly a bike mechanic he has recently worked in Satellite Imagery. He has twin 6 year old daughters who keep him ever busier yet. The FluidFlex FKT was provided at no charge. The opinions herein are entirely the author's. Interesting review. Years ago, I loved the original Montrail Fluidflex. It was a beautifully stripped-down minimal shoe: just enough upper to hold the sole onto your foot. Everything about it felt functional, light, and fast. My only objection was that the sole didn't provide enough rock protection for longer races: I found myself wincing when running on sharp gravel roads near the end of 100k. When Montrail updated the shoe to the "ST", I was very pleased that they added a small rockplate in the forefoot but was dismayed that they added (in my opinion) unnecessary structure to the upper (and heel collar in particular) and created the "FluidFrame" to add torsional stiffness. Instead of making the shoe better, I felt this made it worse. Running on off-camber and uneven trails, my feeling is that this makes a shoe less stable. Can you talk a little about torsional stiffness, and why you think it is a good thing in a trail shoe? I liked the original Fluidflex better. It was both lighter and softer. While I've enjoyed both he original and the ST model, the addition of the rockplate in the ST did make the shoe feel more tippy on rocky terrain. That matches my experience with pretty much all rock plates that are layered right next to the outsole. I'm not sure why more companies don't take the salomon approach where the rock plate is deeper into the sole. That way the cushion conforms better to the terrain and mutes ankle torque. I added a homemade rock guard that I slide under the insole on my fluidflex II's and they are noticeably more fun and stable on technical terrain than the ST's. I feel the same way about the caldorado's, if the trailsheld were stacked above the fluid foam, they'd provide better passive grip and feel way torsionally stable. Well put SG, it is amazing what a difference the positioning, thickness and size of a rock plate can make in a shoe (along with outsole design/flexgrooves and cushioning). Montrail did a great job with the Fluidflex FKT in my opinion, as it contours well over rocks without that tippy feeling, yet protects well enough to not feel every little rock and pebble in the trail. New Balance RC1400 v5 Review: Zoom!